When readers ask, “I’m traveling to Karakol. Is there anything to do there? Where should I go?” We have a raft of ideas, often surprising them. Why? Because most travelers (and guidebooks) know Karakol, a town in eastern Kyrgyzstan, only as a jumping off point for popular day hikes and multi-day treks in the nearby Tian-Shan Mountains. What they don’t often realize, however, is the rich cultural context of the town and what there is to do there. Karakol stands at a crossroads, geographically, culturally and even culinarily. Historically, it was in the middle of what was Turkestan, a region stretching from Mongolia’s Gobi Desert to the Caspian Sea. Today, Karakol bridges China to the east and the rest of Central Asia to the west. Because of this, a kind of ethnic diversity spills into Karakol’s food and markets, and into the activities and atmosphere of the town. Top it all off with traditional Kyrgyz culture, Russian history and influence, and vestiges of the Soviet era, and you have a place in which to engage, but also decompress and catch-up after your time adventuring in the mountains. To help, we created this experiential travel guide to Karakol. It highlights some of the best experiences and memories from our five visits to Karakol over the years, including our most recent trips during spring, summer and winter. It’s peppered with a few others’ recommendations, too. Our intent is to offer some diverse inspiration and practical advice to help you plan your travels in Karakol, to give you the building blocks to create your own itinerary from scratch, and maybe even encourage you to stay longer than you expected as you enjoy some of Karakol’s après-trekking, culinary and cultural features. If you are the outdoor or adventuring sort (as we are), then a visit to Karakol on your trip to Kyrgyzstan is an absolute must. En route, Altyn Arashan to Ala Kol. Turquoise waters of Ala Kol lake. Photo credit: Takao Imazu. 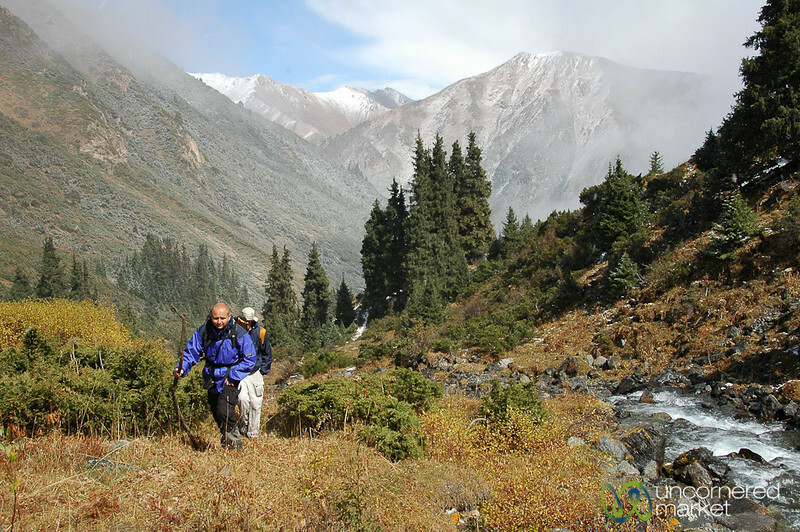 Other treks include Altyn Arashan to Jeti Oguz and the Turgen Valley. Treks in nearby villages include some newly developed trails that set off from the village of Jyrgalan (90 minutes/60km from Karakol). Our Jyrgalan Boz Uchok Lakes trek was three days, but shorter and longer variations are being rolled out, including an option to sleep in a yurt along the way. And for the most serious mountain climbers, there are several peaks nearby that top out well above 5,000 meters. Eight dishes might sound like a lot for dinner, and is best experienced in a group. Dungan cuisine features meat and vegetables, is flush with various greens and is touched with subtle flavors, as well as vinegars and soy. According to Karim and his wife, our hosts for the night, there’s a deliberate approach to meal preparation whose aim is for all the dishes to complement one another. And while eight is the minimum number of dishes they will serve guests, it's usually much more…like the twelve different dishes you see in the photo below. Overwhelmed by Dungan hospitality at a family dinner in the nearby village of Deishin. This experience is more than just a meal; it's a full Dungan village experience in Deishan/Yrdyk (about 15 minutes from Karakol) with a visit to the Dungan museum, mosque and walk through the village. This allowed us to really understand the history and culture of Dungan people and their presence in Kyrgyzstan as a whole, and specifically Karakol and its surroundings. Originally from China, the Dungan people emigrated to Karakol and Deishan village in the 1880s to escape religious persecution and brought with them — and have continued to preserve — their traditions, culture, and cuisine. You’ll find this especially true as you make your way around the Big Bazaar and Little Bazaar in town. Karakol owes a big thanks to Dungan culture for its impact on the local food scene. This gregarious Dungan elder who is full of stories is our guide to Deishan village museum and mosque. How to book this experience: This Dungan village visit and family dinner can be arranged and booked through Destination Karakol Visitor Center (22 Gagarin Street, Karakol). There’s typically a requirement of five people minimum to book, but inquire at the office about joining others interested in the experience. The entire tour is 3 hours, including transport to/from Karakol, village walking tour, museum entrance, and family dinner…more like, feast. Highly recommended. You won't need to eat for days. OK, OK. Maybe this oversells the experience just a little. At the very least, however, a Russian bath offers an immersive (literally) local experience, and a pleasant and inexpensive way to relax, get clean and warm those weary muscles as you wind down in Karakol after a long hike. You can even enjoy a few beers at the bath house along your sauna journey. Bring your trekking mates and make it a social outing. If being naked in public isn’t your thing, don’t worry. You’ll be given a towel – more like a sheet — to wear. Alternatively, you can also book a private sauna at one of the local guest houses in Karakol (e.g., Altamira, Tagaytay, Amir, Intour, Sweet House). How we did it: Karkyra banya (Баня «Каркыра») on Karasaev Street costs around $1.50/hour and features cold and warm pools, a toasty wood sauna and hot showers. It’s not in the center of town, so you’ll need to take a taxi there (fixed price of taxis in town = 70 Som/$1). The Dungan mosque was designed by Chinese architects and artisans between 1907 and 1910 for the local Dungan community. However, the wooden mosque was constructed entirely without the use of nails. Pretty remarkable, like a puzzle. As you walk around, note that it probably doesn’t look like any other mosque you’ve seen in your travels. Much of its imagery, including a wheel of fire and a pagoda (in place of a minaret), harkens to the Dungans' pre-Islamic, Buddhist past. Fruit trees in blossom in springtime at the Dungan Mosque in Karakol. About the Karakol Free Walking Tour: There is now a free walking tour (2.5 hours) of Karakol given by Destination Karakol Visitor Center that begins at the Dungan Mosque and shares the history, legends and stories behind this place. The walking tour continues through the town's main sites and puts into context the local history and mixing bowl of cultures so as to help travelers better understand what they see and feel today. Check with Destination Karakol to confirm the walking tour schedule as it will change throughout the summer, but usual departure time is 9:30AM. Disclosure: We helped develop this walking tour together with Destination Karakol. So, we think it's a pretty cool tour…and hope you do, too! One of the best loved dishes in Karakol is the Dungan spicy, cold soup called ashlan-fu, made from a combination of thick rice noodles, wheat noodles, a vinegar-chili sauce and a topping of chopped herbs. Traditionally, it’s sided with piroshki (fried, potato-stuffed dough pockets), so as to balance the flavor and spice and to enable efficient mopping of the broth. Vegetarians keep an eye out: ashlan-fu can be served vegetarian or with meat. In either case, it’s delightful, refreshing and an absolute must try. Not to mention, we’ve been told it’s the local hangover cure if you’ve taken in too much Kyrgyz cognac. Ashlan-fu, the must try culinary specialty of Karakol. There’s a special alley-way in the Karakol Small Bazaar devoted almost exclusively to ashlan-fu. Take a walk, take your time, then sample away. If you wish to sample ashlan-fu in town, there are plenty of restaurants which specialize in it. Our favorite from our last trip is from this no-name place (look for this sign) on Przhevalskiy Street near the intersection with Jusaeva Street. A hearty bowl will cost you around $0.50. Note however that once they sell out of their fresh, daily supply of ashlan-fu (almost always), they close for the day. Additionally, as part of the Dungan family dinner experience in Deishan village (see #2) you'll learn the secret to making your own ashlan-fu straight from the source. Can't get any better than this family version. Learning how to make ashlan-fu from a Dungan family in Deishan Village near Karakol. Two options here. Head to Ak-Suu Hot Spring or Up Into Altyn Arashan. Altyn Arashan, what a setting to relax your muscles in natural hot springs. Ak-Suu hot spring is closer to town, and in 2017 it ought to feature a new outdoor pool/bar at the lower end of the access road. A bit further afield, and perhaps better timed with a hike, is Altyn Arashan where you can spend the night in a yurt or simple hostel and enjoy soaking in the hot spring pools before or after trekking onward and upward to Ala Kol lake. The sulfurous odor of a natural hot spring offers a hint: the mineral-laden waters feel great and are good for what ails your skin, bones and muscles. The Karakol Big Bazaar seems to sell whatever you need. Warm clothes to top off the pack before your hike to Ala Kol? Check. Dried fruit, nuts and snacks for the trek? Check. Beautiful heaps of colorful spices? Check. Ten different grades of ground red pepper flakes? Check. Walk through the Karakol Big Bazaar and in short order you’ll meet people with Kyrgyz, Russian, Dungan, Uighur, Uzbek, and Kalmak backgrounds selling their wares and specialties. Just a taste: the variety of spices on offer at Karakol Big Bazaar. Endless options for roasted chili peppers, too. Tip: show genuine curiosity and you’ll often be rewarded by the friendliness of the spice and vegetable vendors, and a few free samples along the way. Note: There is also a more centrally-located open market with similar offerings, but on a much smaller scale…hence the name Small Bazaar. We often have our doubts about the relevance of remote history museums. At first glance, the Karakol Historical Museum also drew our doubtful ire. However, its permanent exhibition now includes a well-lit room of black and white photos from Karakol and the wider region (e.g., Turkestan, Uzbekistan, Kyrgyzstan, etc.) taken in the 1930s by Ella Maillart, a Swiss adventurer and likely the first solo female European traveler ever to tackle the region. Maillart’s images, besides being well-composed, also reinforce the concept of Karakol as a crossroads. They convey what the region, including its people and cultures, looked like before Sovietization. It’s worth a quick visit at the beginning of your time in Karakol to better appreciate the city and surrounding area. Warning: you may need to pass by the museum exhibition full of dead, stuffed animals from the region, but the payoff of the photo exhibit is worth it. Russian explorer Nikolay Przhevalsky set up shop in Karakol in the late 19th century. Rumors are that he was sent back to this region several times by the Russian Tsar in order to find a short-cut secret route from Karakol to Tibet. You might be thinking Tibet is nowhere near Kyrgyzstan. However, when you take a step back and look at a map of the region and Przhevalsky’s routes, you begin to realize how close everything really is and how the wider region might be more interconnected than you first imagined. Przhevalsky's Charge: a map of his explorations throughout Central and East Asia. If you’ve traveled elsewhere in Kyrgyzstan, in Central Asia or even in Xinjiang Province in China, the Przhevalsky museum and the telling of his travels provides essential context. If you’d like to understand how the region fits together geographically, historically, and culturally, this stop is an important piece in the puzzle. Note: The museum is just outside of town in a quiet park overlooking Lake Issyk-Kul. A shared taxi from town costs 30 som ($0.40) or around 120 som ($1.40) for the entire taxi. The museum offers a guided tour, included as part of the entry fee, and is recommended to help fill the gaps of the exhibition pieces documented in English. In winter, only a Russian language guide was available. We’re told that English language guides are available in the summer months. If your visit to Karakol falls on the weekend, be sure to check out the rollicking animal market held on Sundays on the town’s outskirts. We can attest that the market, with its array of horse, sheep and cattle, looks much as it did 10 years ago. We can only imagine, especially after checking out Ella Maillart’s images of the market in the 1930s, that not much about its appearance has changed in decades, or possibly even centuries. This perspective alone makes the market worth a visit. It’s a cultural experience unique to Karakol. A prospective customer at the Karakol Animal Market. Livestock sales start early — we're told from 4 AM — at the Karakol Animal Market. Warning: As you might imagine, the animal market gets a little sloppy under foot, particularly if it’s wet. Better not to dress in your Sunday best! If you’ve traveled across Central Asia, you’ll likely have found that the landscape — ranging, mysterious, and remote — hints “Road Trip!” If an urge to hit the road strikes you, or if you just wish to dream and look at old cars, stop by the used (and often antique) car market held on Sundays, right next to the Karakol animal market. Moskvitch. Yours to drive into the hills for just $700. Lada, Niva, Moskvitch, Zhiguli, Volga, UAZ — name any of the old Soviet car models and you are likely to find at least one here for purchase. Some are in original condition, if a little beaten up. Others look as though they’ve been tricked out for cruising around the main square. Prices seem reasonable, even low. With doubt on our faces, we drew plenty of offers to take the merchandise for a test drive. We were tempted to buy the green Moskvitch above (roughly $700) and store it at a friend’s place for our next trip. If you like tchotchke, especially of the Soviet or communist variety, then you might spend all day in this corner antique shop. The owner-collector, Alexandr Korablev, has not only spent decades finding and collecting a sea of Soviet memorabilia but he seems to know the story behind every pin, poster and clock. Alexandr Korablev in his corner Soviet antique shop. You don’t need to break the bank, either. Many smaller items like event and festival pins cost $1 or less. Very affordable, especially if you want to surprise all your friends for Christmas with 1980’s Moscow Olympics paraphernalia. Even if you have no interest in buying anything, pay a visit if only to peer into the past. Where to find it: The Antique Shop is on the corner of Zhamansarieva and Toktogula streets. 13. Discover All the Kyrgyz Felt Products You Never Knew You Needed. We don’t consider ourselves avid shoppers or souvenir buyers when we travel, but the “One Product, One Village” store on Toktogula Street in Karakol draws us each time we visit. The shop, run by a rural women’s development project sponsored by JICA, a Japanese aid organization, has not only trained Kyrgyz women across the country in high quality felt and natural soap production, but it also offers a fair marketplace in which to sell their traditional crafts. Handmade traditional Kyrgyz shyrdaks at One Product, One Village, Karakol. If you’re considering buying souvenirs in Kyrgyzstan — everything from wall hangings to hats and change purses to locally made honeys and jams — this shop is worth a visit. Although the range and style of handicrafts can be somewhat limited, prices and quality are competitive or better than similar shops in Bishkek. After admiring all of the handicrafts in “One Product, One Village”, you might want to understand better the Kyrgyz nomadic tradition of felt making and shyrdaks, and learn how they are made. Ask the staff about the half and full-day outings available (request to see the catalog) to nearby villages, and learn how to make felt, handicrafts, honey, jam and more. Or, send a message to request information through their Facebook page. Learning how to make traditional Kyrgyz shyrdaks (felt carpets) through a handicraft course at Tolgonai. Alternatively, Damira from Tolgonai NGO offers various handicraft courses in town. She has an interesting personal story, too. As she tells it, her skill in traditional crafts passed onto her by her grandmother is what enabled her to get out of debt and support her family as a single-mother. To say she's passionate about Kyrgyz traditions is an understatement. How to book these experiences: The Destination Karakol (Destination Marketing Organization) can help coordinate visits and handicraft courses. If you find yourself desperate for the taste of real coffee — a luxury in a part of the world whose cafes run rivers of Nescafe – check out Fat Cat Karakol at Gagarina Street 22. While there are a number of formidable cafes in town serving coffee, tea and even homemade spirits (e.g., Karakol Coffee) — Fat Cat brewed coffee comes on offer with homemade cookies, cakes and other goodies – a portion of whose sale proceeds go to support community projects for disadvantaged families in the area. Fat Cat is also a haven for meeting English speakers, locals, visitors, and Peace Corps volunteers alike. The owner, Jamila, is full of information about the area and can tell you which other businesses in town — taxi companies, hostels, hair dressers, etc. — also work with her to donate a portion of their profits for community projects. Ok, so you can't go dancing in there now…and we really encourage you not to try for risk of getting thrown out by the priest. However, at one point during Soviet times Karakol's famous Holy Trinity Russian Orthodox Cathedral served as a (rather elaborate) dance hall. Imagine this as a dance hall. Karakol Russian Orthodox Cathedral. The cathedral originally dates back to 1869, a time when Karakol was only a garrison town outpost on the edge of the Tsarist Russian Empire. Back then, the cathedral was a chapel that served Cossacks and other troops. Today, its unusual wooden structure is one of the town's main landmarks. Note: The Russian Orthodox Cathedral is one of the main stops along the free Karakol walking tour. So, if you want to learn more about the legends and stories behind this church be sure to hop on one of the walking tours given by Destination Karakol. Make a point to walk around Karakol and notice all the gingerbread-style windows, doors and awnings. These photogenic gingerbread homes with all their blue and white adornments are a throwback to Karakol as 19th century boom town on the edge of the Russian Empire. Today, they’re very much a unique visual fixture of the Karakol town landscape that remind us of its history. An example of Karakol's gingerbread homes. Hoofs and hinges, a few of the items you'll find on grandma's blanket at the Slavic Market. It’s also the place to go if you need spare parts for that old Soviet car you just bought at the used car market (see #10 above). When visiting Karakol it can be easy to forget that the town is only about fifteen minutes away from Issyk-Kul Lake, the 2nd largest alpine lake in the world. During our last visit we had a chance to go out to the lake and hop on a boat with our Kyrgyz friends. Overlooking the boats docked at Przhevalsk Bay in Lake Issyk-Kul near Karakol. Starting from summer 2017 it's possible to take a 90-minute sunset cruise around this bay and area of Lake Issyk-Kul. Talk about peaceful, tranquil and stunningly beautiful. And yes, the Tian Shan Mountains encircling the lake do stay snow-covered all year round. Enjoying the tranquility and beauty of the mountains and lake from the sunset cruise. How to book this experience: The Karakol sunset cruise can be arranged and booked through Destination Karakol Visitor Center (22 Gagarin Street, Karakol). The sunset cruise schedule may change throughout the summer based on the actual sunset time, but it usually departs Karakol around 6:30PM. The entire tour lasts around 2 hours, including transport to/from Karakol, a free welcome drink and 90-minute boat ride with a sunset viewing stop. A great way to relax after a trek in the mountains. Sure you’ll eat more laghman, homemade noodles topped with vegetables and meat (usually), as you travel across Kyrgyzstan. But, before you do, use Karakol and its restaurant scene to understand the three primary styles — boso laghman (fried), traditional (more soup-like), and guyru laghman (not fried, less soup) — to figure out your favorite. Among the best in town according to our sources, and our own experience, is at Cafe Zarina on Lenin Street 120. Delicious fried, homemade boso laghman. For the full laghman experience, you can sign up for a session with Gulya at her home on how to hand-pull the noodles and enjoy home-cooked Uighur-style laghman and other dishes for a full meal. Dan develops his own technique for hand-pulled laghman noodles. How to book this experience: Get in touch with the Destination Karakol Visitor Center book this laghman noodle and Uighur homecooked meal experience (about 1.5 hours). Gulya really does cook the best laghman we've ever tasted. If there’s a destination in Kyrgyzstan whose food variety, restaurants and culinary scene give vegetarians a fighting chance, it’s Karakol. Get a dose of vegetarian relief with the Dungan and Korean salads (in big buckets) at the Big Bazaar or Small Bazaar. Lots of cabbage, carrot and other salads, often with a vinegar-based sauce, at the markets. Try ashlan-fu, pumpkin manti dumplings, vegetarian laghman and kitaiski (Chinese) salad. Of course, you’ll have to ask questions and do your homework to avoid meat, but there are enough vegetables festooning the market stalls in Karakol to hint at its being a possible vegetarian oasis in Kyrgyzstan, if not all of Central Asia. Some restaurants in Karakol even offer a vegetarian menu. Here is a handy English-Russian translation guide for vegetarians. We find that the people who sell fruits and vegetables are usually the happiest ones in the market. Why these dried, fried fava beans are not served everywhere in Karakol — and throughout Kyrgyzstan — is a mystery to us. Not only is this natural snack tastier and healthier than most other fried snacks, it’s also fresh and different. Each time we've brought bags of these fava beans back to Berlin, our friends tell us we need to begin importing them since they are that good. This is a free hint to Karakol’s entrepreneurs and bar owners: serve these with beer and during happy hour. The Karakol chill out scene will never be the same. Remember diversity and crossroads of cultures that we mentioned at the very beginning? Well, on the Karakol Food Crawl you have a chance to taste what that means for Karakol's unique (and rather delicious) local food scene. In this food walking tour you'll be able to sample a minimum of six dishes or snacks from four different ethnicities – Dungan, Kyrgyz, Tatar and Uighur – and taste what makes each cuisine different, yet also somehow complement the others. As you explore Karakol through its different ethnic cuisines and dishes, you'll hear stories and learn about local eating traditions. For example, in Kyrgyz culture your social status is reflected in the piece of meat you are given at a feast or celebration. How's that for transparency regarding what your hosts really think about you? How to book this experience: The Karakol Food Crawl is organized and delivered through Destination Karakol. Vegetarians are welcome, too! You can book your spot at their Visitor Center (22 Gagarin Street, Karakol) or by sending them note through the Destination Karakol website. There’s typically a requirement of a minimum of four people to book, but inquire at the office about joining others interested in the experience. The entire tour is 2.5 hours, either over lunch or an early dinner, and ends at Fat Cat, a favorite coffee shop, if you want to continue to hang out with others in your group. If trekking isn’t your thing or you wish to cover a bit more ground, find yourself a horse trek and head into the mountains. Horse trekking in Kyrgyzstan is an absolute must-do. If you haven’t already planned or ventured out on a day trek or multi-day ride elsewhere in the country, get your giddy up going in Karakol. Horses and hills, quintessential Kyrgyzstan. How to do it: Destination Karakol visitor center can help make arrangements for you. Alternatively, you can contact Almaz at Bulak Say Horseback and Trekking. You can also check out other local horse trekking options at the Karakol Tourist Info Center, Ecotrek, or CBT Karakol. A little further afield, Jyrgalan village offers horse treks in the summer season with half, full or multi-day horse treks available (contact Destination Jyrgalan for more details). If paragliding isn't your thing, you can also take the Karakol Ski Base lifts to the 3040m Karakol panorama peak in summer. And, if winter sports are more your thing…Karakol becomes a haven for skiers and snowboarders looking for a long skiing season, fresh snow, beautiful views from the slopes, and reasonably priced day passes at $20/day. Karakol peak panorama, 3040m above it all. We've stayed at Hotel Tagatay a few times and it's a nice mid-range guest house with a super friendly owner that uses solar and other renewable energies for heating its hot water and electricity. Most recently, we stayed at Matsunoki Guest House, a Japanese-styled place that has very comfortable beds, an incredibly huge and delicious breakfast, soundproofing to keep it quiet, and a Japanese minimalist design. Also highly recommended. Book a room in Karakol | Read reviews of Karakol hotels. Take a marshrutka (minivan) or shared taxi from Bishkek's main bus station. The journey takes about 5-6 hours. From the South Shore of Lake Issyk-Kul or Cholpon Ata, hop on any marshrutka heading towards Karakol. The main bus station is outside of the town center so you'll need to catch a local taxi (70 som) or marshrutka #109 to get to the center. You can find out more transportation information regarding getting to or from Karakol here. The Destination Karakol Visitor Center at 22 Gagarin Street can help you with English language travel information and book the experiences and tours highlighted here. The office is open from 9AM- 8PM Monday-Saturday and 9AM- 4PM on Sunday. You can also contact them by Whatsapp: +996 558 508 808 or email: info@destinationkarakol.com. Note: In full disclosure, we worked with Destination Karakol to help develop many of these new tours and experiences as part of a tourism development project to promote local tourism initiatives and keep tourism money local. Disclosure: Our experiences in Karakol are from a combination of a personal trip that we made years ago and a more recent visit as part of a tourism development project. These latter trips and compensation for creating this guide were made possible by the support of the American people through the United States Agency for International Development (USAID). The contents are the sole responsibility of the author and do not necessarily reflect the views of USAID or the United States Government. As always, the thoughts contained herein — the what, the why, and the how — are entirely our own. Wow, what a country! Central Asia feels like it is off by itself while the rest of the world is becoming like each other. I need to visit before it changes, too! True that, Larry. Our experiences throughout Central Asia over the years seem to prove that. And our visits to Kyrgyzstan, 10 years apart, reaffirm that. They also suggest that the culture that drew us there in the first place surely endures. The lanscape in some of these photos is unreal!! I don’t think i’ve ever seen proper photos of kyrgystatn before, but I’m definitely interested in planning a trip now! Great post. Glad we and our photos could spark an interest in Karakol and Kyrgyzstan, Dave. You won’t be disappointed should you decide to visit. Wow the scenery here looks absolutely incredible! I am planning to visit next month so there are definitely some great ideas here to add to my itinerary. How long would you suggest spending in the Karakol area? Great to hear that you’re on your way soon to Karakol! There are new experiences and tours available in Karakol now – free walking tour, sunset cruise, foodie tour, Dungan family dinner and village visit – so there’s lots more to do in the town itself. I’d suggest planning three days there, and if you like markets then try to time this over the weekend so that you can go to the animal market on Sunday morning. If you’re planning to go hiking in the area, then you may find yourself through Karakol twice – on the way to the mountains and taking a break on the way back. Enjoy your trip and let us know how your visit goes! Such a comprehensive post guys! I am in Kyrgyzstan at the moment and heading to Karakol later this week so this has provided much food for thought. Thank you. Great to hear that you’re headed to Karakol soon! I believe that the first snow has already fallen so it might be a lovely winter wonderland right now. And, if you like skiing or snowboarding the ski base is open 🙂 Have a great trip! We’ve just done the walking tour with Aman at Destination Karakol. A great blend of history, culture & food with an excellent guide. This is a real asset to showcase what Karakol has on offer (plenty!) I was surprised at the professional approach, now I see your involvement & understand a bit better. Fantastic work, really enhanced our trip to Kyrgyzstan. We really enjoyed our work with Destination Karakol to helping them develop this walking tour, their other local tours (e.g., food crawl, sunset cruise, etc.) and destination branding/identity. So glad to hear that all the work we did together is paying off! We can only choose one because of short time we have for our vacation. Thanks for the kind words about our posts! You ask a tough question here as both the Ala-Kol/Altyn-Arashan and Boz-Uchuk Lakes treks are great. If I had to choose only one I’d suggest the Boz-Uchuk trek for the scenery and also the fact that you’ll likely have the trail to yourself as it’s less crowded. I consulted the Lonely Planet writer who recently updated the Kyrgyzstan guide as he did both treks recently and he also agreed. No matter which trek you choose, you can’t go wrong!